Avaaz - Mexico: Call Off Attacks on Freedom of Expression! Mexico: Call Off Attacks on Freedom of Expression! We demand a full and independent investigation into the murders of the journalist Rubén Espinosa, human rights activist Nadia Vera, and three other women in Mexico City. The governor of Veracruz State, Javier Duarte, should also be investigated thoroughly and without delay. We also urge an immediate review of the procedures established to protect reporters’ lives, and to make a swift commitment to guarantee and protect freedom of expression in Mexico! Mexican photojournalist Rubén Espinosa was just found tortured and murdered, along with outspoken human rights activist Nadia Vera and three other women. Freedom of expression is under attack in one of Latin America's oldest democracies, and Rubén is the 14th journalist killed in the southern state of Veracruz under governor Javier Duarte, who's made open threats against reporters. Almost none of these crimes have been solved. But this case has sent thousands into the streets and set off an explosion in the national and global media. 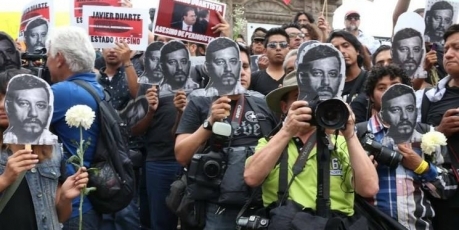 Now hundred's of journalists, writers and artists -- Salman Rushdie, Christiane Amanpour, Gael García Bernal and many more -- have signed an open letter to Mexico's president demanding justice for journalists murdered for doing their jobs. The letter is making waves and we can drive it home by adding over a million more names worldwide, showing that Avaaz members everywhere stand with the freedom of expression fight in Mexico. Add your voice and we'll deliver it directly to Mexico's new ambassador in Washington, and to the Mexican President himself!